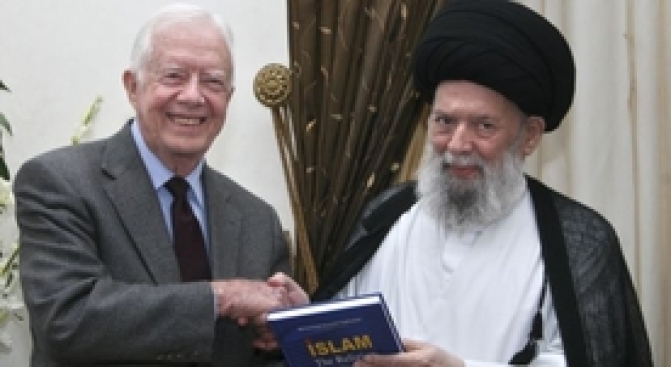 Former President Jimmy Carter has met with several controversial Middle east leaders, such a, Grand Ayatollah Mohammed Hussein Fadlallah, a top cleric in Lebanon. Now he plans to meet with Hamas leaders. After slamming Israeli Prime Minister Benjamin Netanyahu's recent policy speech, ex-prez Jimmy Carter is planning to meet with Hamas leaders. Netanyahu voiced approval for creation of a separate Palestinian state in his speech on Sunday, though he listed a number of conditions ticked off Carter, according to the Guardian. One condition that drew heavy criticism from Carter as well as Palestinian leaders was Netanyahu's insistence that Jewish settlements in East Jerusalem and the West Bank remain. "My opinion is he raised many new obstacles to peace that had not existed under previous prime ministers," said Carter, who is in Israel this week and plans to meet with former Palestinian Prime Minister Ismail Haniyeh. "He still apparently insists on expansion of existing settlements, he demands that the Palestinians and the Arabs recognize Israel as a Jewish state, although 20% of its citizens here are not Jews. This is a new demand." Carter, 84, is one of the most senior Western figures to meet with the group that Israel and most Western nations have dubbed a terrorist organization. His planned meeting with Hamas leaders along with former Palestinian prime minister Ismail Haniyeh is not his fist meeting of the sort. A month ago, Carter met with the organization's unofficial leader, Khaled Meshal, and a year before that Carter sparked controversy when he met with and embraced Hamas politician Nasser Shaer. Following that meeting, Israeli Foreign Ministry spokesman Yigal Palmor said Carter was "dignifying" a group that wants to see Israel destroyed.